Wow! This movie is a must-see, if only for the performances of Christian Bale and Melissa Leo, both of whom won Oscars for best supporting roles (with Bale winning). Honestly, if this movie had focused on just these two characters, it still would have been a great movie; the other actors in this movie are icing on the cake. 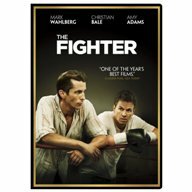 The Fighter is based on a true story about the early days of boxer Micky Ward as played by Mark Wahlberg. Micky tries to make a name for himself as a boxer by escaping the seemingly giant shadow of his older brother, also a fighter, Dicky (Bale). Unfortunately, Dicky, once a prominent boxer who “knocked out” Sugar Ray Leonard, has now spiraled down a path of drugs. He has an HBO film crew following him, filming a documentary about crack in America (he thinks it’s about his comeback at 40 years old). This is the foundation of the story (Micky’s rise and Dicky’s fall), with Melissa Leo playing the overbearing, overprotective mom. Amy Adams (also seen in Sunshine Cleaning) plays the love interest and does a great job. A departure from her usual role; she plays a foul mouthed, hardnosed chick. The fight scenes in this film are excellent and look like an authentic boxing match with a believable script. It’s a shame that Wahlberg gets the lead role because the supporting actors really outshine him.